Smoke from wildfires in British Columbia (BC) has made the air quality in parts of the Canadian province among the worst in the world. 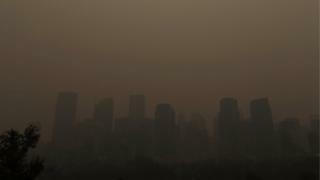 Swaths of western Canada have been blanketed by a smoky haze from over 550 fires burning across the west coast province. The air quality risk, especially in BC's lower mainland, is at its very highest level. The smoke in the air is causing public health concerns for residents. Low visibility caused by the smoke led to the delay and cancellation of some flights in the province on Sunday and Monday. Late last week, the smoke reached into the neighbouring provinces of Alberta and affected air quality into parts Saskatchewan and even Winnipeg, Manitoba, a city about 2,000km (1,240 miles) to the east. People posted images online of cities and towns in BC and Alberta blanketed in a brown or an orange haze. BC declared a state of emergency last Wednesday due to the wildfires. Hot and dry conditions, as well occasional thunderstorms, have created perfect conditions for wildfires in the province. Hundreds of residents are either under evacuation orders or are being warned that they should be ready to leave their homes at a moment's notice. The federal government has also sent resources to the province to help battle the flames. BC experiences up to 2,000 wildfires a year but the majority are contained within 24 hours. Last year, BC was under a 10-week state of emergency to deal with blazes that eventually burned through 1.2m hectares of the province.